BioWare’s recorded another Dragon Age: Inquisition stream, and this time it’s for us PC folk. 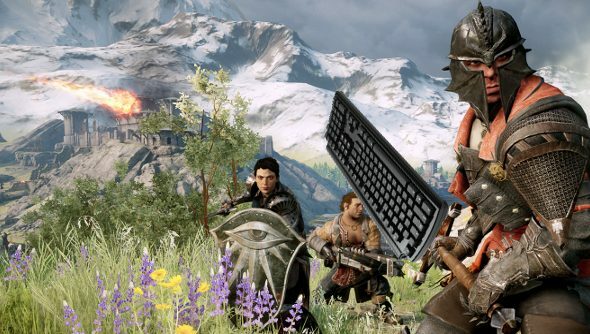 Mike Laidlaw controls the previously unseen Knight Enchanter class using a mouse and keyboard, while also dabbling in tactical combat. There’s even a keyboard cam, so you can see exactly what Laidlaw is doing – it’s all nice and transparent. While the stream kicks off just after the prologue, there’s a bunch of dialogue and some questing, so if you want to go in without being slapped in the face with even small spoilers, then you will probably want to avert your eyes and cover your ears a lot. The stream covers a slew of things, including the war table, the dialogue wheel and the options you will have it your disposal to customise your combat experience. You get a look at the PC UI, too, obviously. The system requirements for Inquisition were revealed on Friday, and cover a broad range of rigs, from nearly antediluvian things, to ones built with 4K gaming in mind.